The gentle lift that lasts. PDO (polydioxanone) is a potent synthetic fibre, consisting of one filament (mono-filament) or two filaments twisted solid (polifilament) which dissolve after a certain time in the tissue. Polydioxanone is a material known and used in medicine for many years. Polydioxanone stimulates the tissue neocolagenesis process - that stimulates the production of new collagen - the protein responsible for the tension and firmness of the skin. In addition, stimulation of fibroblasts results in stimulating the synthesis of elastin - the protein responsible for skin firmness and elasticity. The PDO thread introduction technology is based on using the natural skin tension lines, which also causes an effect similar to a surgical facelift. Thanks to the PDO threads, we can also limit the strength of facial muscles. By introducing the PDO thread in the skin. we get immediate improvement in its appearance. After about 10-14 days. 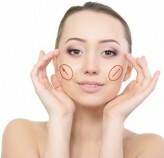 the synthesis begins with the body's natural proteins (collagen and elastin). This process continues throughout the period of maintaining the threads in the body (up to 6-8 months). The resulting aesthetic effects persist typically up to 36 months. Lifting PDO thread is a treatment dedicated primarily for patients aged 30-65 years.